The False Indigo Bush, Amorpha fruticosa, is a somewhat leggy shrub, whose height can range from 6 to 20 feet tall,and 5 to 15 feet wide. Fragrant foliage has the compound pinnate leaves typical of the Pea family, often most bushy on the upper third of the shrub. Flowers are 1/3-inch wide, purple-blue with orange anthers, on 3- to 6-inch upright spikes. Fruit is a warty, kidney shaped pod, persisting into winter. This deciduous shrub does well in full sun and poor, sandy soil. Needs pruning in late winter or early spring to keep shaped. 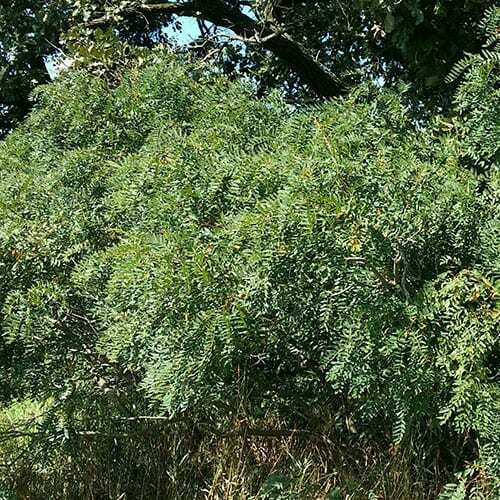 Useful as a large shrub or small tree in areas where there is plenty of water available. Native from Connecticut to Minnesota, south to Louisiana and Florida. This bush attracts butterflies.